Many churches celebrate Palm Sunday, which is the Sunday before Easter. Maybe your church had children waving palm branches to help them connect to the story. But while this is a triumphal entry, it is Jesus’ first step toward His death. “This took place to fulfill what was spoken by the prophet, saying, “Say to the daughter of Zion, ‘Behold, your king is coming to you, humble, and mounted on a donkey, and on a colt, the foal of a beast of burden.’” *The prophecy is cited from Zechariah 9:9 and Isaiah 62:11. Jesus had become somewhat of a celebrity among people who had heard of the miraculous raising of Lazarus from the dead, and they wanted to see Him and treat Him like a king. But Jesus wasn’t arriving to be their king on account of Lazarus; the story of Lazarus would have had the religious leaders in even more of an uproar and determined to put an end to His life, which He knew… Jesus’ glory would be greater than that of a local king. Ramsey describes Jerusalem as a beehive, and the triumphal entry was like hitting that angry hive with a stick. If some of the people weren’t angry enough at Jesus’ entry to the city, He would now declare to them their failure to live up to God’s covenant with them. But Jesus was already a marked man as Ramsey remarks. This is the Monday when Jesus entered the temples and drove out all those who bought and sold things there. 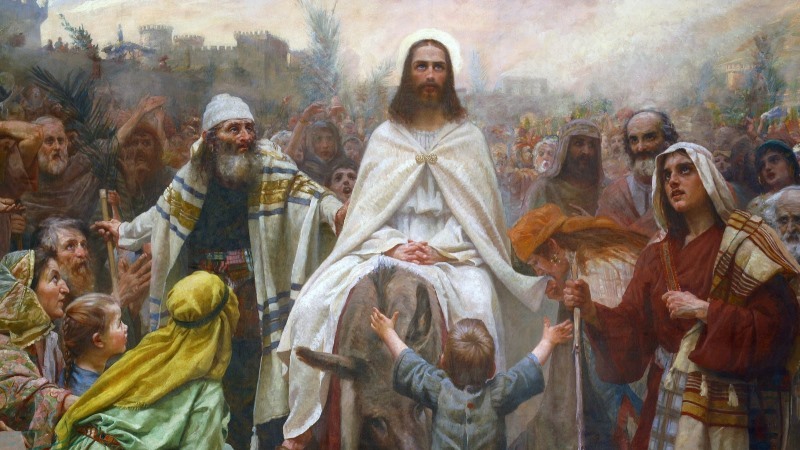 Matthew tells us that even upon seeing the wondrous things Jesus did and hearing the children cry out “Hosanna to the Son of David!” the chief priests and scribes were indignant. Their hearts and minds were made up about this man whom they considered the biggest nuisance to ever enter Jerusalem. Ramsey summarizes, “Much of what the Gospels tell us about Monday centers on the theme of Jesus’s authority—both over the created world and his right to judge it.” Jesus is fulfilling all of the Scriptures; He is the one with the authority in this situation not the religious leaders. Jesus spent Tuesday teaching God’s Word in the temple to all who would listen; “But Tuesday afternoon is the last time Jesus publicly teaches in the temple as a free man. His words on this day are his closing argument, his manifesto,” writes Ramsey. Maundy Thursday covers the washing of the disciples’ feet, the announcement of Jesus’ coming betrayal, the Passover meal, prayer at the Mount of Olives, and ultimately His arrest in Gethsemane. As Ramsey comments, Jesus isn’t just there to pray at the Mount of Olives…He is there to wait. He knows what’s coming, He has been waiting for it, and He is ready to fulfill His promise. Later this night the Sanhedrine met to decide Jesus’ fate, and they called for His death. Today is the day Jesus was delivered over to Pilate the governor of Judaea. When Pilate asked Jesus if He was King of the Jews, He responded that Pilate had said so. Still, Pilate believed Jesus had done nothing deserving of death and tried to free Him by asking the people which prisoner they wanted released (as was custom)—but the people shouted Barabbas. Even at the urging of his wife not to harm this man because of a dream she had, Pilate continued on in the death proceedings. Jesus was beaten, mocked, and crucified—but there was something different about His death. Less is written about this day in Scripture than any other day in Holy Week, but this is the only full day where Jesus’ body lay buried. As Ramsey writes, the chief priests may have scoffed at Jesus’ prophecy but they did not forget it. The religious leaders were paranoid that something might happen still. To read Russ Ramsey’s article in its entirety please visit TheGospelCoalition.org. Reflect on these eight days of Easter during this year’s Holy Week, and read the Scriptures prayerfully with purpose. Share this wonderful truth with your family and friends as you prepare for Easter.